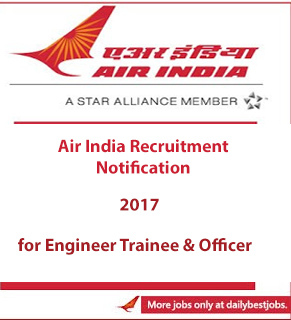 Air India having new job recruitment vacancies for the 2017 year to recruit for Engineer Trainee & Officer post through this official recruitment notification. If you were like to join this Air India job open vacancy then join across in India as they are hiring for the post of Engineer Trainee & Officer. Who Can Apply? Those candidates who had completed their B.E. or B.Tech can apply for the post of Engineer Trainee & Officer. Air India employers are planning to recruit 28 candidates for this job vacancy of Engineer Trainee & Officer. Those who are confident eligible or interested candidates can apply before 14/03/2017. Air India allows to receive offline mode applications from all the interested applicants. Eligibility: The Eligible candidates can submit their application to Air India before the last date on 14/03/2017. Find the below for more information like Age & Eligibility, Salary, Total number of Vacancy, Selection Process, Job details, Last date, Application process and other useful details for this below post. Read carefully all the details before submitting your application by offline mode. Address for this job: Air India, Kolkata, India. (a) Those applicants who provided services in any Government sector, any Semi-Government or in any Public Sector can apply this job vacancy in proper manner. (b) Air India management holds their full rights to modify or able to make any change in the above schedule, condition, requirement, total number of posts based on the current need in future at any time period. (c) Any change or false details filled in the form will not qualify that selected candidate. (i) Eligible applicants easily apply on or before 14/03/2017 for the selection. (ii) There is no any further detail info on the selection process is clarified in the official job advertisement notification. (iii) Those applicants whose match the required eligibility will must be attend the Psychometric Test. This test will arrange after the screening all the applied job applications. This test will be conduct at Delhi or at Mumbai branch of Air India which will decide by Air India Limited. (iv) After all test completed by qualified applicants will be select for final process which was based on their performance shown at all stages of selection process. (a) Desired candidates have to visit career tab in official website of Air India i.e. www.airindia.in. In that, you have to fill all the required spaces asked as per application format with pasting a current passport size photo of candidate. (b) You have to pay DD means Demand Draft of Rs.3000 in the favor of Air India Limited which is payable at Kolkata and send on this address of Kolkata office. (c) Also, attach all the requirement documents such as birth date certificate, all attested academic qualification and experience certificates, certificate of license with flying logbook etc with job application form. (d) If candidate belongs to OBC/SC or SC will have to attach caste certificate which was issued by central government of India. There is no application fee have to pay by SC/ST candidates. All the applicants must remember the last date to apply this job vacancy for Engineer Trainee & Officer Post on or before 14/03/2017. Also check, Canara Bank Job Recruitment Notification 2017. All the best to the candidates who will apply for this job vacancy and we will provide you more daily best jobs vacancies and notifications for you. Subscribe our job alert which will directly receive to your email address.